Unintentional Treat for the Kids. I was recently approached by another mom, from Positively Kids, wanting to do a raw food challenge. Since I’ve been working on regaining my healthy eating and not grabbing handfuls of fish crackers and the other ‘kid’ snacks that manage to find their way into my house, I accepted. We (like everyone else!) have been super busy with all of the holiday planning and celebrating, so I really need to head to the grocery store and load up on more items for this raw eating endeavor, but did already have a good amount on hand to start right away. It does take a bit of prep and planning, but for me, prepping food satisfies part of the craving. It’s all part of the eating experience. Taking the time to cut, slice, shred and prepare causes me to think more about my food choices and what I am feeding myself and my family. I started out really simply with fruits, veggies, nuts and seeds. The other day I was trying to think of something to prep for the next morning and decided to try these oat cookies. When the kids saw them, they were begging for them! Looks like this will find its way into our morning rotation…or even as an after dinner treat – which is what my 3-year-old just requested. This recipe is the amount I would eat for breakfast. Truth be told, I just eat it by the spoonful out of the mixing bowl, but it will make about 5 cookies. Feel free to double or triple the batch size to suit your needs. Mix together, cover and let sit in the refrigerator over night. If you are planning to make cookies, roll the mix into a tube shape with parchment or plastic wrap before placing into the fridge. In the morning, use a sharp knife to slice. Cover any unused portions and store in the refrigerator. Don’t get me wrong, my kids are great eaters, but sometimes it’s helpful to make something sound more exciting than it really is. I discovered this when my middle-little was about a year or so old. That is when I started serving waffle cookies. What are these little treats? Absolutely nothing more than plain and simple, regular whole wheat waffles. Because she heard cookie, she was hooked! She will often eat them without syrup or any other topping, just holding and eating it…like a cookie. Now, I have fallen victim to a few Pinterest-fails. When I tried the individual baked oatmeal, it wasn’t a total disaster, but I had a heck of a time peeling them out of the muffin papers. 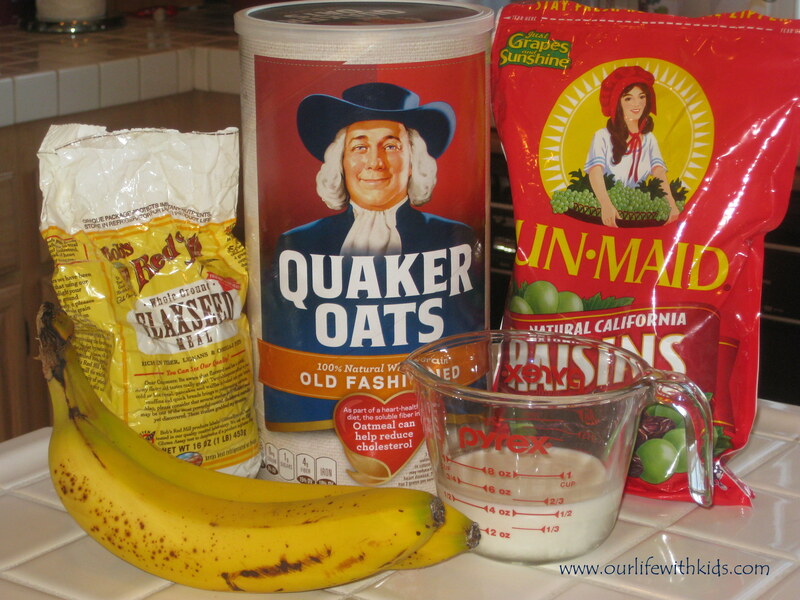 The other day my niece said she was eating 2-ingredient cookies; just quick oats and bananas. I thought – c-o-o-k-i-e-s! I won’t have to peel the wrappers off and what kid wouldn’t like breakfast cookies?! 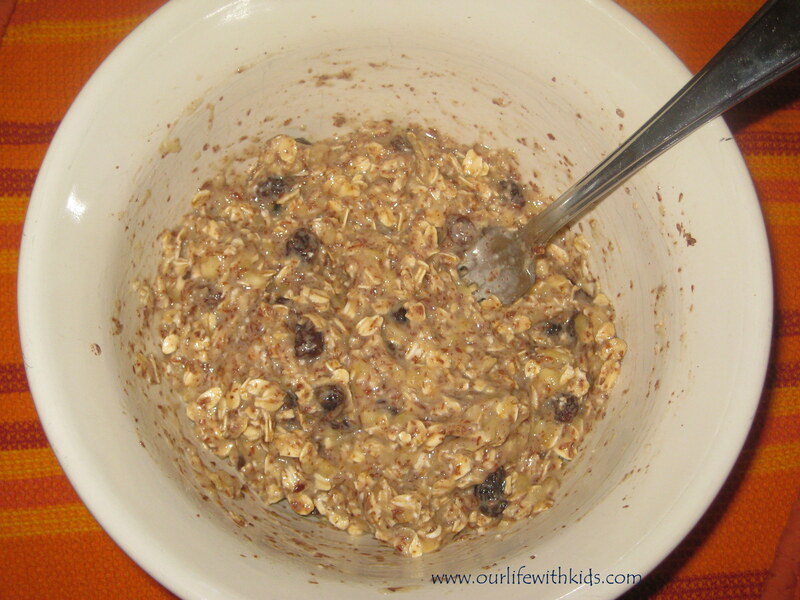 I didn’t use quick oats and I also like to add flax seed meal to these types of recipes, so I fiddled around and came up with these, which turned out to be VERY kid-approved! 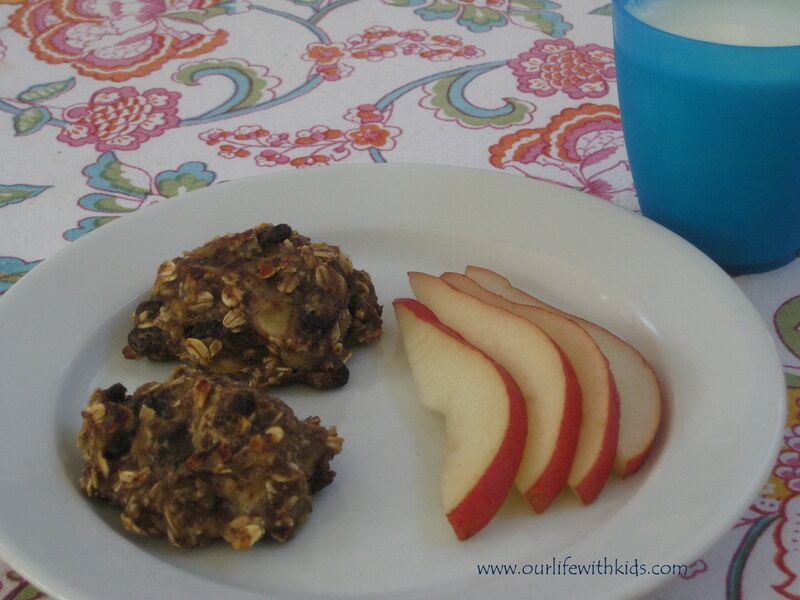 Keep in mind, these are not going to taste like the oatmeal cookie recipe that comes on the oatmeal container, but you can eat these knowing they are a guilt-free, healthy breakfast and are even good on-the-go. Please don’t hate on my ingredients; in a perfect world everything would be organic, maybe even grown at home, free of any controversy, totally perfect for the world brands. I don’t know if there are any specific issues with these brands, but feel free to use whatever brands you care to. The only thing I would say is, make sure not to use quick oats, in my opinion, things turn out a little too gummy with them. Mix all ingredients together and spoon out on a cookie sheet. Because there is no oil in the cookies, I placed them on a piece of parchment that I spritzed with vegetable oil. Bake at 350F for 15 minutes, flip the cookies and bake for an additional 7 minutes. 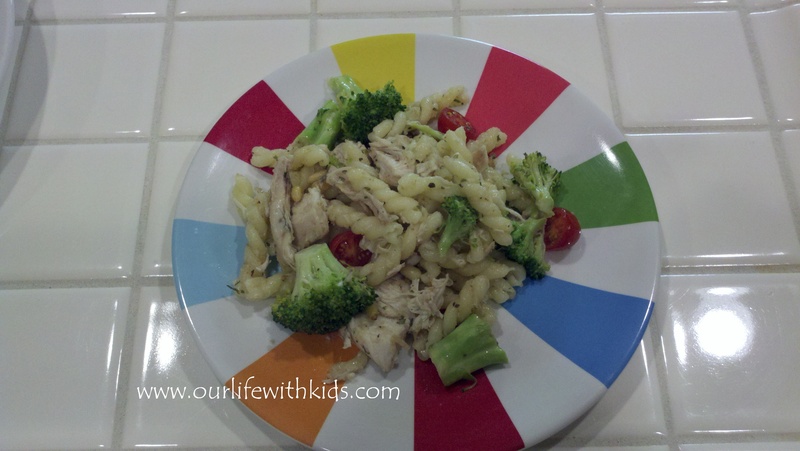 Note: If you need to hide veggies in order to get your kids (or you) to eat them, I would add shredded carrot or zucchini to this recipe. I’ll update this page once I try it. My guess at this point would be to add about ¾ cup of either shredded carrot or shredded zucchini. Well, to be honest, it wasn’t all that big of a pumpkin. It was a sugar pumpkin. The kids didn’t want big pumpkins this year, so we picked out some sugar pumpkins. Instead of carving them into jack-o-lanterns, they were just as happy painting them with non-toxic, water based paint (I knew I would be cooking them after Halloween). When they decided to go with the smaller pumpkins, I instantly started scrolling through my pumpkin recipes. I learned a few years ago that you could just bake the pumpkin whole! I thought this was the neatest idea and after trying it, realized how super simple it is! 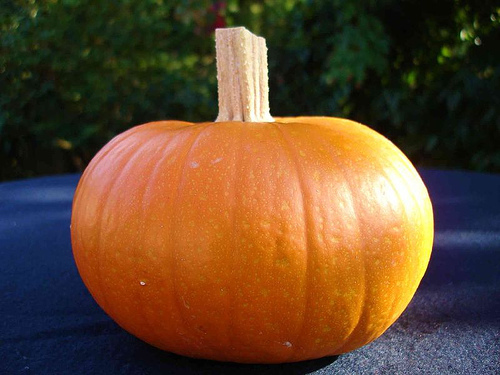 Just place the pumpkin on a baking sheet in a 350 degree oven and bake for approximately 45 minutes. Let it cool for a bit before you cut it in half and scrape out the seeds and stringy parts with a spoon. After peeling it, run the pumpkin through the food processor or a blender and use it in place of canned pumpkin in your recipes.We strayed a little from the original recipe this time around. In addition to using fresh pumpkin, you can use your own chicken stock. We also did not have the pear nectar, so we used our juicer and juiced some apples and carrots instead. With grilled cheese sandwiches, it was the perfect fall meal! In a 6-quart saucepan, combine pumpkin puree, chicken broth, and pear nectar. Bring to a boil over high heat. Cover, reduce heat to low, and simmer 10 minutes. In a blender or the bowl of a food processor fitted with chopping blade, process 1 cup pumpkin mixture with peanut butter until smooth. Return to saucepan with the remaining pumpkin mixture. Add garlic, ginger root, green onion, lime juice, salt, and cayenne pepper; cook 10 minutes over medium heat. Divide soup among soup plates and garnish with pumpkin seeds and chives, if desired. Serve immediately. He clearly didn’t know my slow cooker was on the other side! 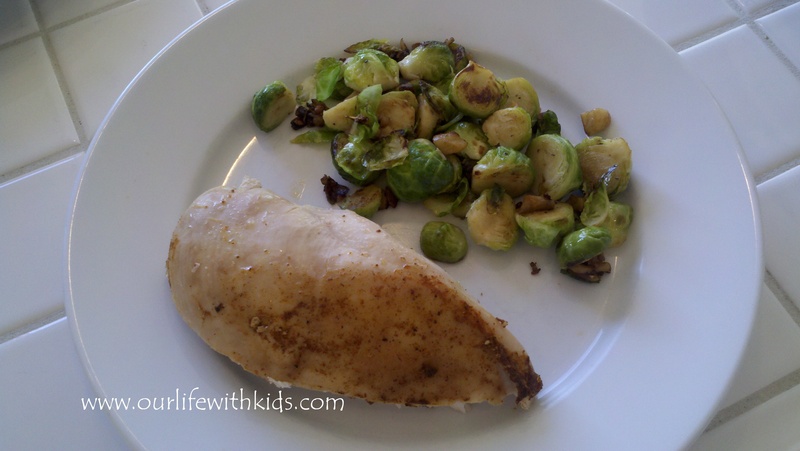 With the unseasonably hot weather, roasting a chicken in the oven was not happening! 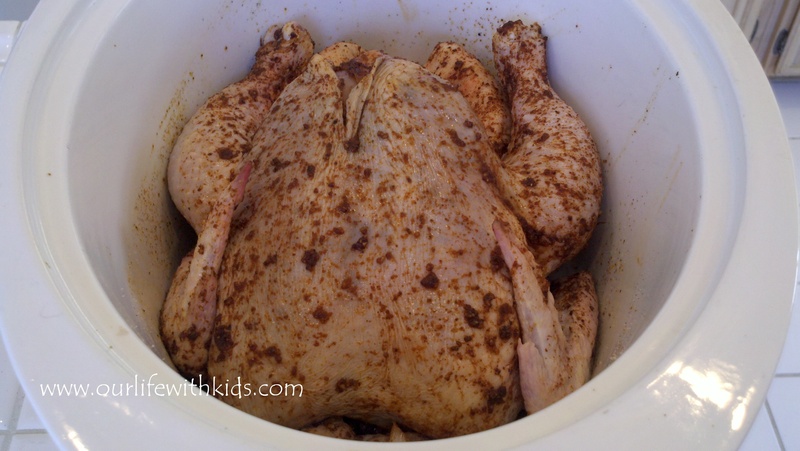 We scored a great price on a roasting chicken, so into the slow cooker it went. We pretty much followed this recipe from food.com, but to be honest, next time I will follow their cooking time (hubby cooked it on high for 3 hours and low for 1 hour), I would definitely cook on low! The flavor was great, but it seemed a bit dry to me. No one else complained, but I’m certain I can get it right! 4 tsp salt (per recipe reviews, 2 tsp is better) – I went with 2 tsp. 1 tsp cayenne pepper – I used chili powder, because it’s what I had. 1 tsp thyme – This invoked an entire “whose on 1st” scenario in my house. 1 tsp white pepper – Didn’t have it, didn’t use it. 1 cup chopped onion (optional) I opted to use it. Rub spice mixture onto the chicken. Place in resealable plastic bag and refrigerate overnight. I skipped this step. When ready to cook, put chopped onion in bottom of crock pot. I used the onion. The original recipe recommends a pop-up timer. I didn’t use a pop-up timer, but will cook on low next time. This easily fed all five of us and we had leftovers for the next night. I boiled pasta and chopped the leftover chicken. 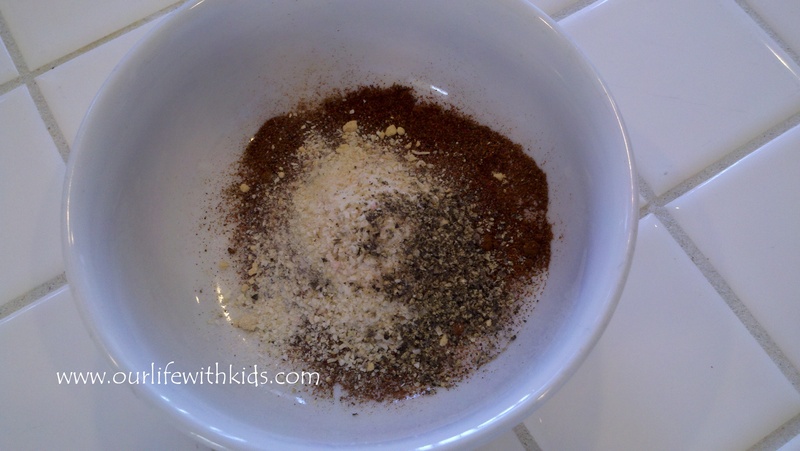 A handful of seasoned breadcrumbs – I use garlic powder, salt, oregano, basil and parsley in mine. No one ever likes the heels of the loaves of bread, so I save them in a Ziploc in the freezer until I’m ready to make breadcrumbs. I mentioned in a previous post that Luke had recently been inspired to start juicing. The discussions we had following the documentary we watched, forced him to see that he really wasn’t making the best food choices when he was not at home. 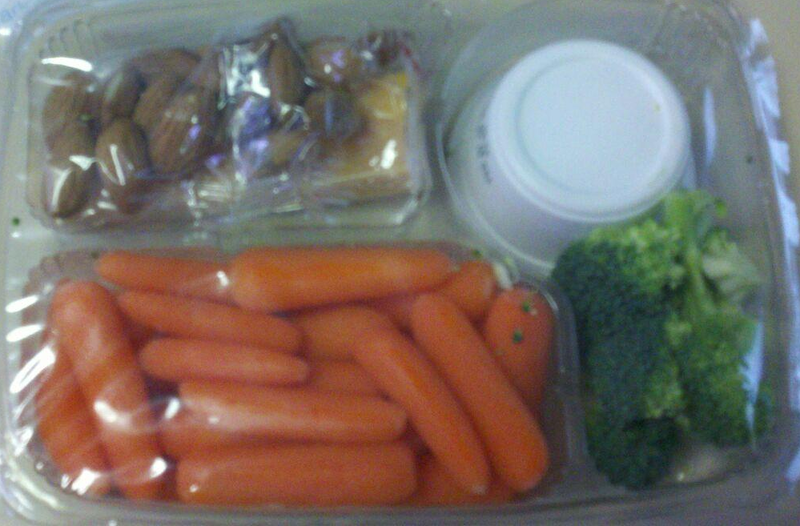 In the past week and a half, he has taken the lead in doing all the juicing for us and even sent me this pic today, of what he is having with his chicken sandwich at lunch. He is not choosing to do a juice fast at this point, but starts each day with a glass of water with approx. 2 tablespoons of lemon juice, followed by a cup of freshly juiced veggies and fruits (primarily veggies). At the end of week 1, he is down 5 lbs, and has stopped drinking caffeine. It is amazing how little changes can make such a big difference! 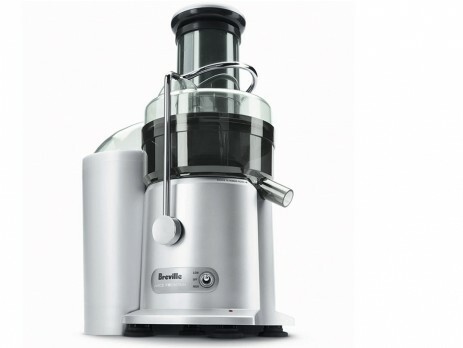 We have been keeping track of the juices we like, and will include them when Luke writes his first post about his experience with juicing. Like many families, everyone is running in a million different directions all at once. Our typical week contains homework, karate, swimming lessons, physical therapy, play dates, Sunday school and any number of other projects that come up. Luke and I have been trying to simplify things by planning ahead and using the slow cooker, but on occasion, we don’t get the prep done in time. What can I say, our meal planning is a work in progress. 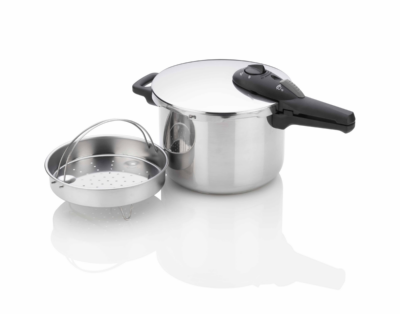 We have, however, discovered a new weapon in the kitchen; a pressure cooker! Ours is a 6 quart, that is similar to this one. Let’s get back to the pressure cooker. The other day Luke and I were planning to make a slow cooker recipe with beans. We woke up that morning and realized that neither of us had soaked the beans. I recommended that we soak them, then use the pressure cooker later on that evening. It worked great! Since then, we have steamed artichokes, made rice and last night we made Kalua Pork. The artichokes were a pretty good size, and even kept whole, steamed in 6 minutes! The Kalua Pork was WONDERFUL and super easy! I’ll post the recipe in a bit. Finally, this brings me to the rice. Plain brown rice. Every now and then, I will admit to resorting to the frozen, pre-made rice that we have found at Trader Joe’s. I wondered, why can’t we just make our own rice and freeze it for those nights that we get behind schedule? Since we are able to make quite a bit of rice in a 6 quart pressure cooker, we did just that! We portioned it in Ziploc bags and now we are ready for nights we don’t have an hour to cook rice! 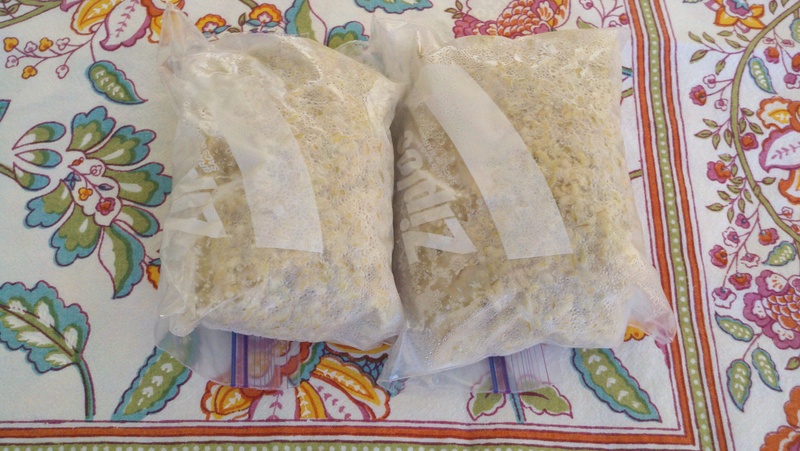 The only thing I would do differently is to put the rice into the bags in a thinner layer, so they stack better in the freezer and you can loosen up the rice a bit prior to reheating. Luke loaded the Ziplocs, and in an attempt to get all the air out, forced all of the rice to the bottom of the bag and the top few inches of the bag are folded over. We’ll try the flatter way next time, but this still works. We purchased it with a 20% off coupon at Bed, Bath & Beyond! Do I need to remind you how much I love a deal?! While I don’t intend on putting the kids on a juice fast, I think they would benefit from the surge of nutrients they would get from a morning juice with their normal breakfast. Additionally, I have been planning to add a “Dad’s Corner” section to this blog, so be on the lookout for posts from Luke as he learns to juice and incorporates more fruits and vegetable into his diet!